The New England Patriots begin the second half of the regular season when they travel to take on the Denver Broncos on Sunday Night Football. This week’s game will be broadcast by NBC on Sunday, November 12 at 8:30 p.m. ET and can be seen on NBC Boston – 10. Al Michaels will handle play-by-play duties with Cris Collinsworth as the color analyst. Michele Tafoya will work from the sidelines. The game will also be aired on the Patriots flagship radio station 98.5 The Sports Hub with Bob Socci and Scott Zolak on the call, produced by Marc Capello. The Patriots (6-2) are coming off the bye week. In their last game, they defeated the Los Angeles Chargers 21-13. They are banged up and missing several key players. The Broncos (3-5) return home after an ugly 51-23 shellacking at the hands of the Philadelphia Eagles. They’ll be looking to get back on track at the hands of their hated rivals, who they always seem to beat in Denver. The Patriots and Broncos have met since the beginnings of the old AFL in 1960 and the games have always gone in streaks. However, in Denver, the Patriots always seem to play poorly and have had a rough time getting many victories there. Denver holds an all-time 30-22 advantage in their history and a commanding 23-10 edge at home. Although the Patriots took last year’s meeting 16-3 in Denver. The Patriots running game has been emerging the past few weeks as they have been tinkering with different looks and formations. Dion Lewis has been the workhorse and figures to see the bulk of the carries again on Sunday. But they will use Mike Gillislee and Rex Burkhead liberally as well as they try to remain balanced. The Broncos were allowing only about 72 yards per game on the ground after being gashed last season. However last week against Philadelphia, they were run on to the tune of 197 yards and three touchdowns. Don’t expect a repeat performance of that in Denver. Domata Peko has been an excellent acquisition for them in the running game. 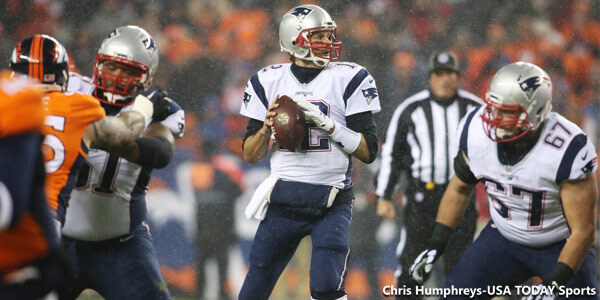 Look for the Patriots to mix things up this week to try to keep the pass rush off balance. Lewis and Burkhead will probably the key runners to watch this week with Gillislee in for any short-yardage/goal line situations. It won’t be a big statistical day for the backs but if they can run enough to keep them honest it will be enough. The Patriots passing game is averaging 300 yards per game, 2nd best in the league this season, despite Tom Brady being under a lot of pressure every week. Now they’re facing one of the better pass rushing teams in the league with Von Miller and the Denver secondary, the “No-Fly-Zone” which will be a big test for the passing game. With no Julian Edelman and no Chris Hogan, Tom Brady will have Brandin Cooks, Danny Amendola and Phillip Dorsett on the outside. The running backs, James White, Rex Burkhead and Dion Lewis will have to pick up some slack in the passing game this week. Denver has allowed just 192 yards per game via the air. The key this week for New England is the tight ends. Rob Gronkowski will be the target that Brady will try to match up with. Denver’s defense, if it has a weakness is defending the tight ends. Of course, they know the Patriots are short-handed at WR and will try to matchup accordingly. This week we may see more of the rookie tight end, Jacob Hollister, attacking the seams in two tight end sets. The outside linebackers are very good pass rushers but aren’t as comfortable in coverage. Marcus Cannon may not play which means LaAdrian Waddle will be going against Von Miller. Another matchup to watch. The Broncos running game has been up and down this season. When they won three of their first four, the new-found commitment to running the ball was paying dividends. But during their four-game losing streak, the running game has faltered and put too much pressure on their quarterbacks, who aren’t getting it done. The Broncos have a trio of good backs in C.J. Anderson, Jamaal Charles, and Devontae Booker. The Patriots have not been good against the run despite seeming to turn the corner in recent games. Against the Chargers, other than one play they set the edge and stuffed the inside very well. But that one play was one where everything broke down and resulted in an 87-yard touchdown run. Such has been the defense for much of this year. This is the key to the game here. If Denver can’t run effectively enough to make play action passing a factor, and has to put the ball in Brock Osweiler’s hands, then it is a losing proposition for them. Alan Branch and Ricky Jean Francois, filling in for the injured Malcom Brown will have to step up. And setting the edge is extremely important this week. Denver’s passing game has been mired in mediocrity because of quarterback play. They still have Emmanuel Sanders and Demaryius Thomas at wide receiver, former Patriot A.J. Derby at tight end as well as Charles, Booker and Anderson out of the backfield. Broncos QBs have been sacked 28 times and intercepted 12 times. The Patriots pass defense was historically bad thru the first six games of the season. But they’ve begun to turn things around and the past two games against Matt Ryan and Philip Rivers the secondary has been much improved. The team should get Stephon Gilmore back this week, helping the depth and hopefully Eric Rowe soon. The key this week from a New England perspective is putting the ball in Osweiler’s hands. If he’s forced to throw in third and long all game long, that is a winning formula for New England. Denver’s pass protection has been shoddy, but the Patriots pass rush hasn’t exactly been superb this season. We’ll see if Matt Patricia dials up some different looks in an attempt to generate some turnovers. The Patriots’ Stephen Gostkowski has had a very solid season. His kickoffs have been spot on to pin opponents deep. The coverage units have been outstanding and getting better. The return game has been getting a boost by Danny Amendola and Dion Lewis in recent games. Ryan Allen’s average hasn’t been great, but he’s consistently putting punts inside the 20-yard line. The Broncos Special Teams has been pretty awful. Brandon McManus has missed five field goals out of his first 15 attempts before going 3-3 last week. Their coverage units haven’t been great and this is another area that the Patriots could exploit this week. This one should be a typical New England game in Denver where they always seem to struggle offensively to put points on the board. 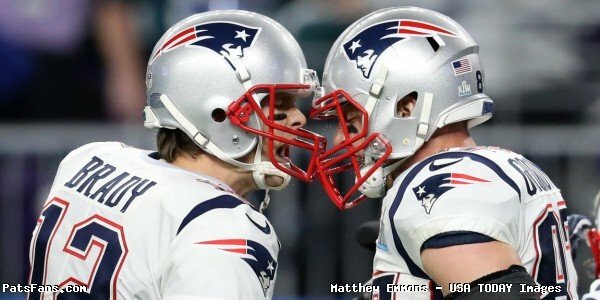 In the past five years, the Patriots average scoring 36 points in three home games against Denver and just 18.5 points a game in four away games. Turnovers are going to be key here, the Patriots have to win the turnover battle. Back in 2015 they were controlling the game when a muffed punt opened the door for Denver to roar back and win the game in overtime. The Broncos offense has struggled to score in their four-game losing streak. Don’t give them any short fields for easy points. 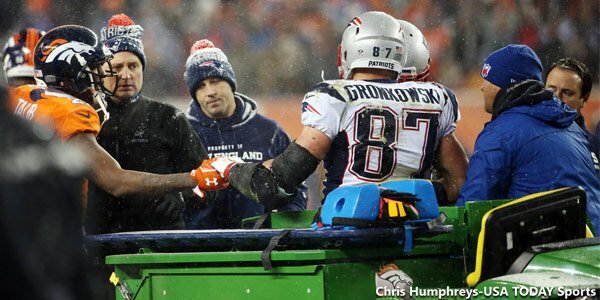 This entry was posted in 2017 Patriots Season, NFL Commentary, Patriots Commentary, Patriots News, Patriots Rumors and tagged 2017 Patriots Season, Aqib Talib, Bill Belichick, Chris Harris, Demaryius Thomas, Denver Broncos, Dion Lewis, Domata Peko, Dont'a Hightower, Emmanuel Sanders, Jacob Hollister, James White, Julian Edelman, Malcolm Butler, Martellus Bennett, New England Patriots, NFL, Patriots, Rob Gronkowski, Tom Brady, Trey Flowers, Von Miller on November 10, 2017 by Steve Balestrieri. The Patriots dominated the game after the first quarter yesterday and shut down the Denver Broncos using good, solid defense and an efficient, quick running winning 16-3. While it won’t win many style points, it was a satisfying, team win with very good performances in all three phases of the game. With the victory, the Pats clinched the AFC East for a record 8th straight year and for the 14th time in the past 16 years. And what made the victory even sweeter was that it can against a heated rival and in a stadium where they’ve had trouble winning for 56 years. Coupled with the fact that they put a big dent in Denver’s playoff chances makes the win even more satisfying. The Patriots are 7-0 on the road and 12-2 overall, they hold the top seed in the AFC and control their own destiny in terms of home-field advantage in the AFC. So, although we had to take a couple of weeks off from our report cards, it is time to get back to it. Before hitting the All-22 coaches’ film, here are our grades for the week. We’ll start with the offense and the players can come forward to pick up their grade sheets. Tom Brady didn’t have his greatest game, and certainly didn’t light up the stat sheet going just 16-32 for 188 yards with no touchdowns or interceptions. He started the game 0-6, not completing a pass in the first quarter. This was part of that was part of the game plan where the Patriots didn’t want to have to rely on the passing game to win today. Instead, the plan was on to control the clock and line of scrimmage with the running game. Brady moved extremely well in the pocket, stepping up or sliding to avoid pressure. He made a couple of really, nice throws to Julian Edelman. The first when the Pats faced a 1st and 20, he dropped the ball deep down the sideline where #11 did a toe-tap before going out of bounds. Later he dropped another dime over the outstretched arms of the defender to Edelman for a big first down. So, after a rough start, Brady did just what they set out to do. The offense was conservative by design and they never relinquished control once they got it. LeGarrette Blount wasn’t a big part of the game plan that everyone thought he’d be. The Broncos speed in the back seven negated the advantage of having the big man bulldoze his way thru the pile. He had meager stats on the day with just 31 yards but again, that was partially by design. The Patriots for this game opted to go with the quicker and shiftier Lewis. Blount, however, did get the only touchdown of the game and it set a new franchise record for rushing touchdowns (15) which he’ll probably add to in the next two weeks. Dion Lewis had a career day getting 95 yards on 18 carries. He was the perfect answer for the Broncos dime package. They’d bring in six defensive backs to counter the pass and Brady would hand it off to Lewis. He had his heaviest workload of his Patriots career and looks like a perfect complement to Blount with the postseason approaching. James White wasn’t anywhere nearly as effective as we envisioned in this game in our pregame matchups. Although the Patriots tried to get him heavily involved early, he was ineffective including a couple of big drops which short-circuited drives. But he nearly broke a long touchdown reception later in the game when a shoe-string tackle was all between him and the end zone. What a difference it has been having James Develin back this season. He rarely shows up on the stat sheet, he did make a catch for 14 yards today, but the holes he opens in the running game are invaluable. Phil Simms on the telecast equated Develin to a tackle and showed him pancake Sylvester Williams the Denver nose-tackle. The Patriots other than Julian Edelman didn’t target the wide receivers much. That is a testament to the respect they have for the Denver corners. The conservative approach cut out the possibility for a turnover and wasn’t pretty at times but it worked. 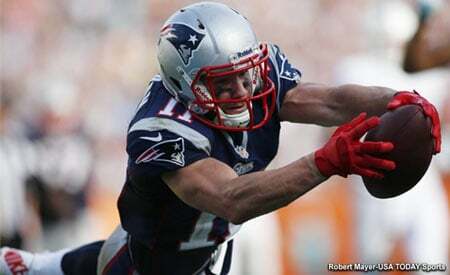 Julian Edelman isn’t the biggest WR, nor the fastest, but there aren’t many with more heart or tougher. Edelman is fully healthy now and has always made a living of going in dangerous places making the tough catches in traffic. He made six catches for 75 yards but that sideline catch between two defenders where he toe-tapped before going out of bounds was a beauty. Martellus Bennett only had two catches for 35 yards but it was the big one for 34 yards that set the team up for a field goal in the fourth quarter that helped put the team away. Bennett did a good job of run blocking today and with him starting to get healthy, he should become a bigger factor in the passing game. Matt Lengel got just a few snaps in but got a tongue-lashing from Bennett on one play. Presumably for lining up in the wrong place. What else can we add about the offensive line? Remember the AFCCG last January? 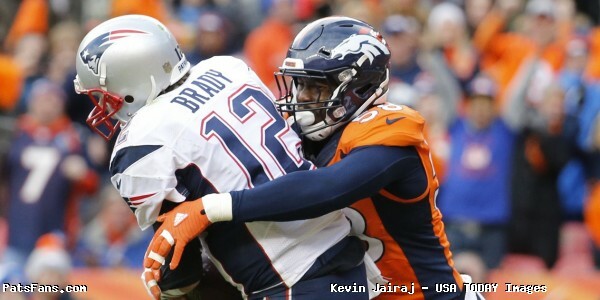 Von Miller and DeMarcus Ware wreaked havoc on Brady as the OL was bullied, bashed and beaten on nearly every snap. Well today it was the Pats offensive line who did the pushing around. The Patriots ground out 139 tough yards in the running game to control the clock and the tempo. Marcus Cannon and Nate Solder were flat out excellent. Miller and Ware had zero sacks, zero tackles for loss, and zero QB hits. Cannon has been going thru a rejuvenation this season with Dante Scarnecchia but even the most die-hard fans circled these last two games against Baltimore and Denver as the big tests. Well, he aced them both. Game ball to Cannon. There were a couple of ticky-tack holding penalties on David Andrews and Joe Thuney, especially considering the mugging that Denver’s OL was getting away with early in the game. But overall this was a truly dominant effort. Redemption game for the OL. The Patriots defensive line dominated in the trenches again. Denver rushed for just 58 yards on the day and averaged 3.4 yards per attempt. 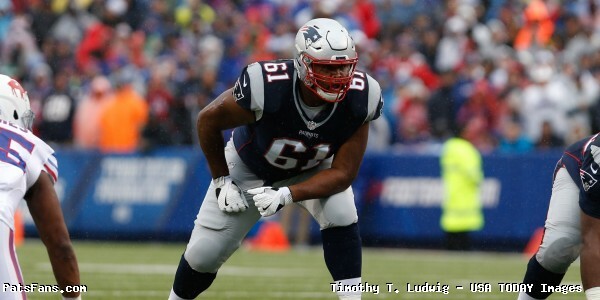 Alan Branch who has been excellent all season and Malcom Brown were stout at the point of attack. Brown chipped in with a sack. The edge rushers, Trey Flowers, Jabaal Sheard, and Chris Long had an outstanding day. Flowers chipped in with two sacks, his sixth and seventh of the year. He’s peaking at just the right time. And oh, by the way, remember the worry warts who were proclaiming the doom of the Pats defense without Chandler Jones? Jones is in the middle of another late-season swoon. In Jones’ last four games he’s gotten zero sacks. 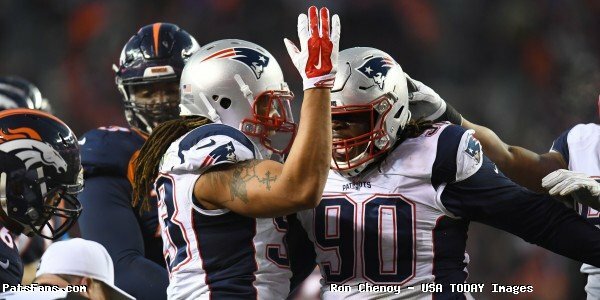 Sheard had a fantastic game with a sack, two QB hits and was playing like a beast on the edge, consistently having his way with RT Donald Stephenson. The Patriots’ other move this season that was lambasted was the trade of Jamie Collins to Cleveland. While the jury will be out on that one until the season is over, no one can argue with the production the team is getting out of Kyle Van Noy. He’s neither the athletic freak nor a Pro-Bowler but what he is, is a damned-good addition to the Patriots defense. Van Noy can do a bunch of things, cover the running backs either in the flat or on wheel routes, rush the passer and help on the tight ends. He covered an early wheel route in the end zone perfectly, which forced the Broncos into settling for a field goal. He also read a screen pass in the flat and flew up to nail the play in the backfield for a loss. He blitzed up the A-gap a few times as well. Dont’a Hightower was his usual stout presence in the running game. He was questionable in this game due to a late addition to the injury report for a knee injury but was more than up for the task. Shea McClellin even got into the act…on offense as a decoy. It was that kind of day. The Patriots secondary had a very solid game and it begins with the play of Malcolm Butler. Butler was lined up with Emmanuel Sanders and with over the top help, he relegated him to the side of a milk carton until he caught a couple of passes in garbage time late in the 4th quarter. Eric Rowe and Logan Ryan matched up with Demaryius Thomas and had very solid outings, for the most part taking away the deep ball and forcing Denver to take the underneath stuff. Trevor Siemian had a nice 1st quarter but after that, the defense, specifically the secondary adjusted and he and the Broncos passing game was held in check. Ryan turned the game on the first play of the 2nd quarter. Facing a third and short, Siemian tried to hit Sanders on a quick out pattern at the Patriots 4-yard line. Ryan read it perfectly and jumped the route, easily intercepting the pass. He returned it 46 yards to the Denver 46. Brady then led a drive to put New England up for good. It was a 14-point turnaround. Devin McCourty had another terrific game as the QB of the back seven. His thunderous hit on Thomas jarred the ball loose on a 4th down attempt late in the game. Stephen Gostkowski is no longer in a slump, he went back to the scene of his frustration like Cannon and helped erase some of the sting of his miss last year. He was 3-3 on field goals, right down the middle and good on his only extra point. Ryan Allen once again did a terrific job of pinning the Broncos deep in their end. Allen’s only short punt was muffed by Jordan Norwood where Jonathan Jones was alert and recovered the ball leading to the Patriots first field goal. The coverage units were solid although the return game was stuck in neutral. But they didn’t have any slipups this week. Edelman was back fielding punts as Cyrus Jones was a healthy scratch…not surprisingly. Bill Belichick’s game plan to use the running game wasn’t a surprise. What was, at least a little bit was the use of Lewis’ quick running instead of battering the Broncos with Blount. It worked very well and the offense controlled the clock and the tempo. Denver’s defense couldn’t tee off on Brady at all. Josh McDaniels called a very solid game for the offense with the exception of one drive with just eight minutes left. He eschewed the running game for three straight passes which was a head-scratcher considering the success they were having at running the ball. But overall, he did exactly what they set out to do. Matt Patricia who was under fire just a few weeks ago, has got the defense playing super situational football. After Denver moved the ball well in the first quarter, Patricia adjusted the defense and they shut them down and out from that point onward. Patricia has found roles for all of his players and not only are they comfortable within the system, their level of play has increased as they play much faster and instinctive now. 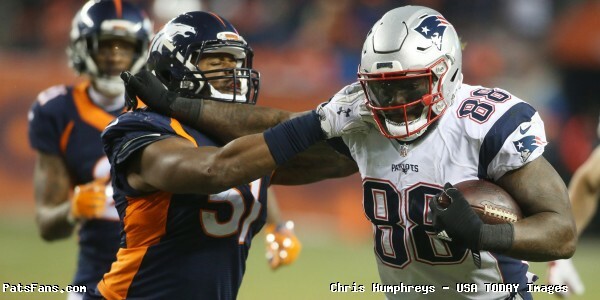 This entry was posted in Patriots Commentary, Patriots News and tagged 2016 NFL Season, 2016 Patriots season, Bill Belichick, Chandler Jones, Chris Hogan, Danny Amendola, DeMarcus Ware, Demaryius Thomas, Denver Broncos, Dion Lewis, Dont'a Hightower, Emmanuel Sanders, Jabaal Sheard, James White, Julian Edelman, LaGarrette Blount, Logan Ryan, Malcolm Butler, Martellus Bennett, New England Patriots, NFL, Patriots, Patriots edge rushers, Tom Brady, Trevor Siemian, Trey Flowers, Von Miller on December 19, 2016 by Steve Balestrieri. The Patriots are alone at the top of the AFC and travel to Denver to take on the Broncos at 4:25 p.m. on Sunday afternoon. This will be the third trip to Denver for the Patriots in the last 13 months. 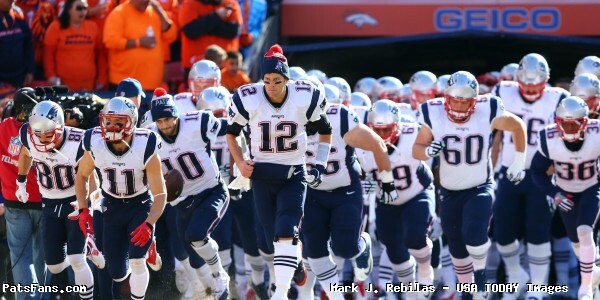 The situation is quite like a year ago when the Patriots visited Denver at 10-0 and the Broncos were two games back. This meeting is a bit later in the season and unlike a year ago, the Broncos are a team desperate for a win. At 8-5, they need to win to keep their playoff hopes alive. Presently they sit in the #6 seed with the tiebreaker over Miami. But tough games remain against the Chiefs and Raiders so they’ll need to seal the deal at home. The Broncos have the #1 pass defense in the league and will be looking to use their vaunted pass rush against Tom Brady and slow down the Patriots passing game. Their edge rushers Von Miller, DeMarcus Ware and Shane Ray are productive and had big games against Brady twice last year. The Patriots are 11-2 and the offense didn’t seem to miss Rob Gronkowski when they faced the #1 defense in the league last Monday night. Against the Ravens, the Patriots rolled up 496 yards of offense and 30 points. They’re hoping to carry that over against the team that beat them twice in 2015. QB Tom Brady: Brady has pretty much had his way most every team in the NFL, and that includes Denver. But not on the road, Brady is just 2-7 against the Broncos in Mile High. This has been a rivalry dominated by the home teams. In the last ten games between the two, the home team has won 9 of 10. Brady is sure to know this and will surely be thinking about the heartbreaking loss last year in the AFC Championship Game where a two-point conversion with just 12 seconds left failed, which would have sent the game into overtime. But the future Hall of Famer knows what’s at stake this week. 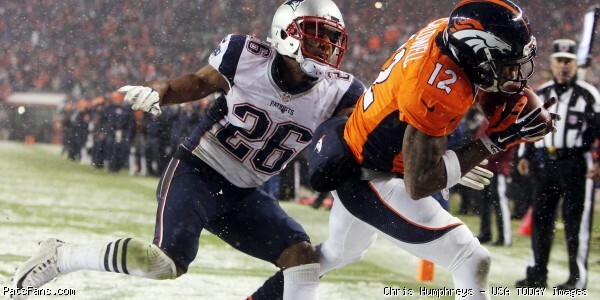 With a win, the Pats clinch a first round bye and deal Denver a serious blow to their playoff hopes. A win on Sunday won’t erase a lot of bad memories in Denver, but it will go a long way in doing so. Running Back James White: With much of the focus this week and justifiably so on LeGarrette Blount, it may be White who holds the key to attacking Denver’s defense. The Broncos haven’t been good against the run this season and Blount and Dion Lewis will bear most of the heavy lifting there. But in the passing game is where White may open things up for Brady thru the air. Denver will be minus Brandon Marshall on Sunday, and fellow inside linebacker Todd Davis is hurting too. The Patriots will look to spread out the Broncos defense on passing downs and find mismatches by isolating White and Lewis on the linebackers. With the backs keeping the Denver defense honest, they’ll have to respect the run this time around and won’t be able to just pin their ears back and rush the QB. Look for White to move in motion and be split out wide at times, giving Brady a look at how the Broncos coverage will be set up. If they’re forced to start using a safety on him, it will open single coverage for one of their wide receivers. Safety Devin McCourty: The Patriots defense has been much better the past month especially in the passing game and this week the secondary will be facing a pair of very prolific receivers in Demaryius Thomas and Emmanuel Sanders. The Denver passing game hasn’t been as vertical as we’ve seen in years past but it is still a very viable one with those two receivers. And the Pats final line of defense is McCourty. Against the Ravens last week, he picked off a deep Joe Flacco pass to Mike Wallace and the Patriots would love to see more of that this week. But with each of the receivers’ ability to go deep, McCourty will ultimately see time against both. The Patriots game plan every week is to take away the big, chunk plays and make the opponent slowly make their way down the field. Against a young QB like Trevor Siemian who has struggled lately, this strategy will be even more important. McCourty will have a big say in how effective their strategy will be with his performance this week. Right Tackle Marcus Cannon: The Patriots right tackle is having a career best season in 2016, but he too can recall the nightmare of the AFC Championship Game in January. Von Miller had 2.5 sacks and rode roughshod over not just Cannon but anyone who was in front of him that day. Cannon would love to turn the tables on him this season and not only setting the outside edge but opening holes in the running game as well. Denver is second in the NFL in sacks with 38, one behind Carolina but is the most efficient pass rush team. One way to slow down Miller, Ware, and Co.? Running the football. And Cannon has been very good at opening holes from Blount to run through this season. Cannon was just rewarded with a nice contract extension for the Patriots. Here’s an opportunity to show he’s earned it by keeping Brady upright this time and paving the way for a Patriots ground attack that should be much more effective than the last two times they faced this defense. This will be Cannon’s biggest test of the year…so far. Linebacker Kyle Van Noy: The Patriots made a trade for the misused former 2nd round pick from the Detroit Lions this fall and he’s been rewarding them with some stellar play recently. After the trade of Jamie Collins to Cleveland, the team was searching for a replacement of his production and they found it with a combination of Van Noy and Shea McClellin. As he’s found a comfort level in the defense, Van Noy’s production has increased. He can do a bit of everything. While McClellin is generally on the field for running downs, Van Noy has taken over in coverage and for the most part has been very good. He’s also adept at rushing the passer and can bring a lot to the table. Facing a Denver team that has struggled to run the football in 2016, Van Noy should see plenty of snaps against the Broncos on Sunday afternoon. He should see some coverage on TEs Virgil Green and A.J. Derby and it wouldn’t be surprising if he blitzes a few times up the A-gap as they mix things up with their pass rush against Siemian. This entry was posted in Patriots Commentary, Patriots News and tagged 2016 NFL Season, Bill Belichick, Chris Hogan, Danny Amendola, DeMarcus Ware, Demaryius Thomas, Denver Broncos, Dion Lewis, Dont'a Hightower, Emmanuel Sanders, Jabaal Sheard, Julian Edelman, LaGarrette Blount, Malcolm Butler, Martellus Bennett, Mike Wallace, New England Patriots, NFL, Patriots, Patriots edge rushers, Rob Gronkowski, Rob Ninkovich, Shane Ray, Tom Brady, Trevor Siemian, Trey Flowers, Von Miller on December 17, 2016 by Steve Balestrieri.